hahaha Ivan, I just started a great debate here in my office for the best Khao Soi in Chiang Mai. The others said it’s in Soi Fah-Ham, near Micromic Hospital and Payap University They even drew a map!!! 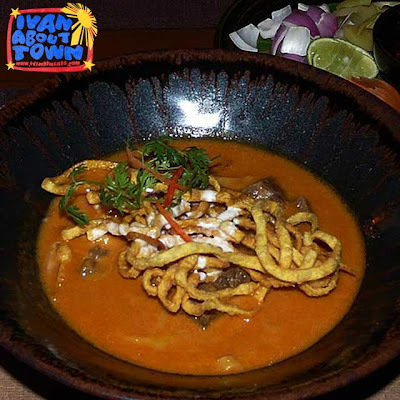 Once upon a time I worked part time in a Bangkok restaurant cheesily named “Khao Soi on the Soi”. Don’t ask why, but it was great fun and the food was the very best. I can’t tell you where the best sample of that dish can be found in Chiang Mai, but I can certainly tell you that it was served in Soi Phipat near Convent Road in 1998. I’m really glad you liked that dish, and your post brought me back in time. I worked in northeast Thailand, based in Chiang Mai in the early 90s. I was taken to a noodle house where my Thai colleagues wolf down several bowls in quick succession and I could manage only two. It was very good and cheap compared to Ma Mon Luk. Food in Thailand appears o be similar in quality whether eaten on roadside, small or big restaurants. The use of fresh mushrooms which I like very much is universal, unlike here where even the better Chinese restos use dried mushrooms. There is always good coffee in roadside restaurants and washrooms are always clean, unlike here. That is why not even the fanciest slogan can surmount Philippine tourist problems.